I've been wanting to make a sweet potato pie for a long time. This past weekend, when I may or may not have had midterms to be studying for, I baked up a storm of pies. I made Pumpkin, Black Bottom Pumpkin, Sweet Potato, and made a pie crust tutorial. It's baking season, obviously! I have been really lacking in my consistency of posts recently, so when I get the urge (and the time) I take full advantage of it. 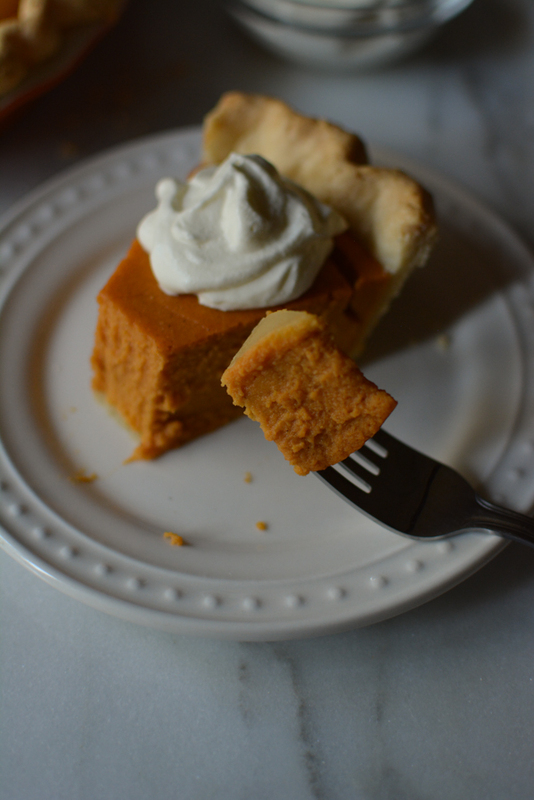 If you like sweet potatoes, you will love this pie. It's a different take on the traditional sweet potato casserole that is common at Thanksgiving, but in pie form. Have you seen these sweet potato cupcakes with toasted marshmallow frosting I made a few years ago? STILL one of my favorites! Just like those cupcakes, this is basically that classic casserole flavor but in a pie. Top with whipped cream (or OMG marshmallow frosting) and devour. Ever since I made this pie last weekend I haven't stopped thinking about it. I'm planning to bring it to Thanksgiving this year! Sweet potatoes get dressed up with brown sugar and warm fall spices. This pie takes on the flavor of the classic sweet potato casserole. Prepare the pie crust in pie pan. 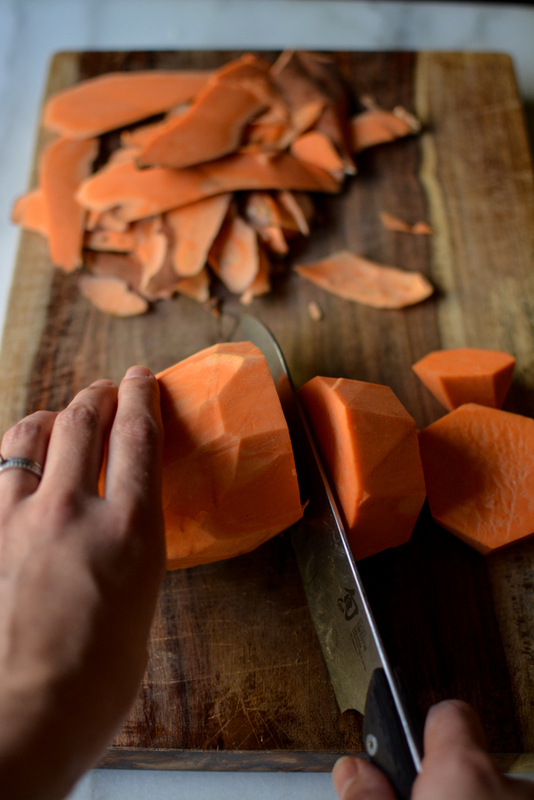 Peel, and chop up sweet potato into even sized chunks, about 1 1/2 inches. Steam sweet potatoes until tender, about 20 minutes. Put sweet potatoes in a saucepan, and add the brown sugar, cinnamon, nutmeg, cardamom, and salt. Over medium-low heat, cook down the sweet potatoes a little more. Use an immersion blender to break up chunks, or transfer to a blender after cooking down for a few minutes. Once the mixture is smooth and has cooled to lukewarm, add the eggs and heavy cream. Add 2/3 cup heavy cream at first, and if the filling is still very thick, add the reamining 1/3 cup heavy cream to thin it out. Preheat the oven to 375 F, and place a cookie sheet on the middle rack of the oven. Once pie filling is cool, pour it into the pie crust lined pie dish. Set the pie in the oven, on the cookie sheet, and bake for 30-40 minutes. The pie is done when the outer two-thirds are set, and the inner thrid of the pie looks slightly wet still. It should give a sturdy jiggle like jello. Let pie cool for a few hours on the counter, and then chill before serving.